Working with a pure white palette is unforgiving but always rewarding. Its textures and tones evoke a calm and freshness that are at home in city or country. In a white room, everything fits in with everything else: when you rearrange or want to buy more, there are few complications. Give decorating with white a try! White is never boring. It is a very dramatic color. White can be cozy. Avoid hard, modern pieces. Instead, use fluffy cushions and distressed pieces. White makes for a flexible and forgiving first step. Paint a room white, and you have a blank canvas for anything. Pair whites with pastels, but proceed carefully. They can read as baby colors, so choose mellow shades that impart just a whisper of smoky pink, blue or green. Wood warms up even the most sparsely furnished white room. There’s a lot of movement in wood. In effect, it starts to feel like a print- just a very subtle one. Other low-key ways to add interest and depth: Fabrics with woven tone-on-tone chevron or herringbone patterns and marble countertops. Not all whites match. Once you start layering different tones, you can’t assume they’ll all go together. You’ve got to look at them next to each other to see if they blend. White allows you to approach decorating as you do fashion. You can freshen up a white room just by swapping out throw pillows: blue ones for summer, orange ones for winter, and so on. 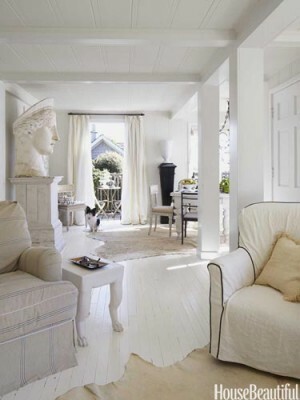 Drapes deliver the wow of white upholstery without the fear. White-linen curtains are much less likely to get stained than everyday pieces, such as a sofa cover. White demands accessorizing. Layers of objects with different textures are where white rooms really come together. The tiles in this bathroom shine. The feeling of more space was created by using a French vanilla color scheme. 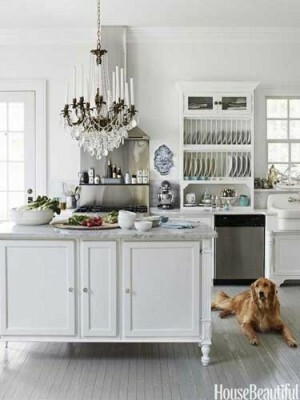 High gloss paint and crystallized glass counters make this white kitchen shine. This airy hallway is accented by a beautiful vintage chandelier.